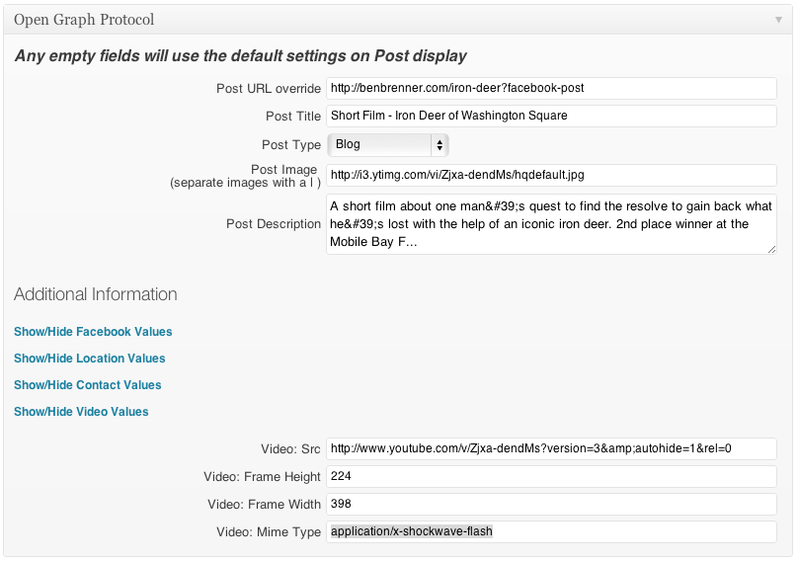 Facebook Preview for embedded Youtube Clips in Wordpress. The scenario. You post videos from youtube to your wordpress blog. People share your blog post on Facebook, but the share doesn't include a preview picture or appropriate preview video. 2. Look at the source of the page of the youtube video you are embedding. All of the "og:" properties are Facebook's Open Graph meta tags that let facebook know what it should do when posting on a wall. Post Title: Probably you don't need your SEO title full of keywords. Just something people will want to click on. Post Image: this is found on the youtube source property "og:image"
Video Src: use the link from the "og:video"property. Add "&rel=0" to the end so that no related videos show up after your video plays. Video: Frame Height: copy value from "og:video:height"
Video: Frame Width: copy value from "og:video:width". Note, if this is much wider than 224, Facebook will pretend like it's going to play your video but won't show your video. 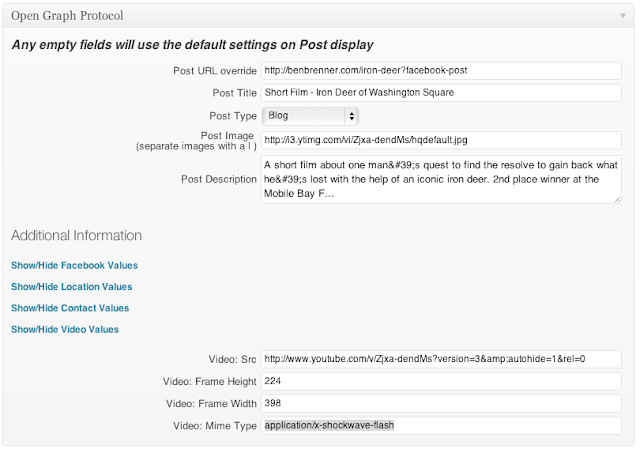 Video Mime Type: always "application/x-shockwave-flash"
put your post's url in the "Input URL" section. Click debug. This will clear Facebook's internal cache of your post. Test it on your wall. If something looks wrong, delete the post. make the change, debug the url, then try it again. Good luck.